Retired Major General, Norman Mc Lean addressing the opening session of the Private Sector Commission’s 2018 Annual General Meeting. Guyana’s Private Sector Commission (PSC) on Thursday said it was engaging government on its Green State Development Strategy (GSDS), but at the same time poured cold water on government preference for solar energy and small hydro stations because they would be unable to supply cheap energy for manufacturing. The umbrella business organisation stressed that large-scale hydro power plants were key for Guyana to keep its traditional sectors alive as well as bridge trade deficits with sister Caribbean countries and Brazil instead of relying heavily on the new oil economy. 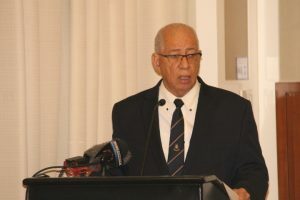 Speaking at the opening of the PSC’s Annual General Meeting held at the Guyana Marriott hotel, the PSC’s outgoing Secretary, Retired Major General Norman Mc Lean said his organisation was “deeply involved and embedded” with government and is represented on the seven GSDS thematic areas. At the same time, the ex military officer turned private sector executive cited the need for cheap electricity to focus heavily on existing productive areas such as agriculture, mining, quarrying, manufacturing, forestry and rice instead of more emphasis on oil. “The key to our future rests with energy and electricity. We continue to pay a very high price for generating electricity. Whilst we congratulate the government for its emphasis on the Green State Development Strategy, based on solar and wind, those will not electrify an industrialised Guyana,” he said. Chairman of the Trade and Investment Committee of the Private Sector Commission, Deodat Indar delivering a presentation on trade and investment at the PSC’s 2018 Annual General Meeting. The PSC Secretary said government’s emphasis on small hydro-power plants such as the one at Moco-Moco, Rupununi; Tumatumari, Eclipse and others “can only electrify small communities within” those areas such as Lethem, Mahdia, Konawaruk, Arakaka, Matthew’s Ridge and elsewhere being afforded electricity. “These will provide electricity outside the grid and those local communities will, therefore, benefit from these small hydros,” he added. The PSC called on government to revive plans to build long-planned hydro-power stations at Amaila, Korow, Turtuba and others need to be developed to ensure Guyana’s economy is sustainable through clean and renewable resources. The coalition-led government, since coming to power in 2015, abandoned plans to build a 150 megawatt hydro-electricity plant at Amaila Falls, citing a number of pitfalls in the financing and technical formulas. Government’s plans to use natural gas as a “cleaner and cheaper resource” was lauded by the PSC but only as an temporary source to reduce the cost of power generation for manufacturing and industrialisation. “The future of ours is a bright one not only driven by oil but by the diversification of our economy, not just oil,” he said. Meanwhile, Head of the PSC’s Trade and Investment Sub-Committee, Deodat Indar expressed concern that Guyana was unable to reap the full benefits of the Caribbean Community’s Single Market, and bilateral trade agreements with Colombia, Costa Rica, Dominican Republic, Argentina, China and Brazil. 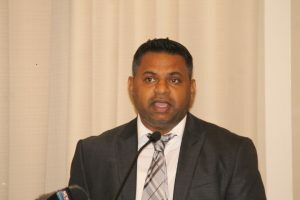 “We have all of these agreement but the question is: Is it to the benefit of the Guyanese businesses because our trade deficits represent that we import more than we export,” he said, adding that there were different reasons for that. Indar recommended that the PSC and government should establish the various mechanisms to make local businesses more export-ready. Based on figures he has seen, the business executive said from 2014 to 2017 the evidence shows that trade deficits were narrowing, an indication that Guyana was consuming more locally produced goods. However, he said there has been a decline in foreign direct investment for the same period which could have an impact on foreign exchange. In that regard, he recommended that efforts be made to attract investments other than in the oil sector. “What we have to do is encourage non-oil investments so although Guyana might be 127 on the World Bank Index (of doing business), that does not stop an investor from coming to Guyana and invest in oil projects… but what we need to do is look at the non-oil projects. Those are the ones that are on the periphery- support systems in infrastructure, medicine, education, security…” said Indar who is also the President of the Georgetown Chamber of Commerce and Industry.